I am a community worker for local charity the Yorkshire Dales Millennium Trust (YDMT) based in Clapham. YDMT is a small charity doing big things to help care for the landscape, economy and people in this special place – the Yorkshire Dales. 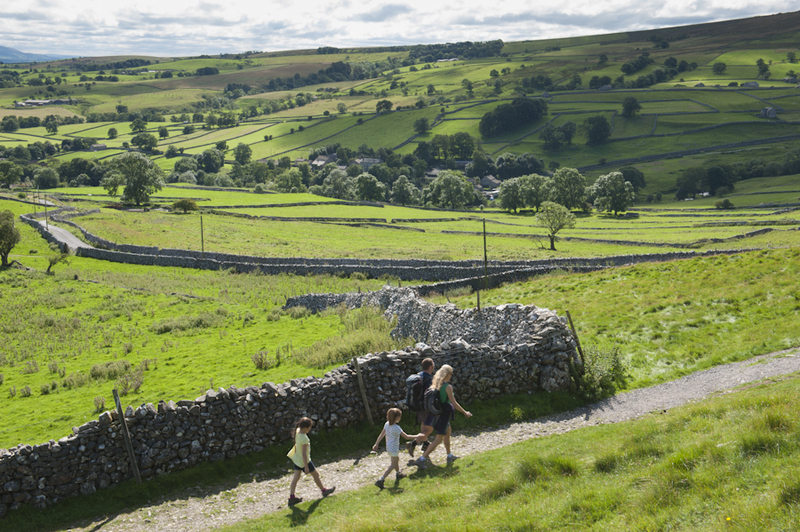 The People and the Dales project gives disadvantaged groups of people the opportunity to visit the Yorkshire Dales countryside, take part in activities, enjoy the magnificent landscape and learn new skills. We work with groups from the nearby urban areas of Leeds, Bradford, Keighley, West Yorkshire and North East Lancashire. People take part in fun, active and thought-provoking activities which help them learn about the natural environment, gain new experiences, enthuse and inspire people to return to the Dales, all whilst improving their physical health and well-being! No two days are the same. One day I could be out drystone walling with a group of refugees, another I could be walking to Malham Cove with a group of Mums and toddlers. The activities we offer vary depending on the group coming out. I started working in environmental education more years ago than I care to remember after studying Environmental Science and Geography at University. During my studies I was lucky enough to spend lots of time exploring the Dales and had a year’s placement working in a Field Centre in the Peak District. I’ve enjoyed helping a wide range of people in a range of places enjoy the natural world ever since. Ooh hard question being out with groups in many Dales locations is just fantastic, seeing the smiles, laughter and sense of calm come over people as they begin to leave their cares and troubles behind them and enjoy the countryside, the fresh air, natural sights and smells and being with others. What do you think visitors gain from being with you? New experiences and opportunities, a chance to get away from it all and leave their often difficult lives behind for a day, positive experiences and memories, new friendships, the knowledge that the Dales are there for them to enjoy and also how they can get here themselves and a chance to improve their health and their well-being in a relaxed and often in a new to them way. Water is really soothing and calming so a short stroll to somewhere like Janet’s Foss in Malham should provide an instant lift. My favourite is to get out in the open or up high on a breezy day and let the wind blow the cobwebs away – my favourite spot for this is Crummackdale. Where do you feel sudden swooping joy? On the bridleway coming up out of Feizor just before you turn into Oxenber Woods you get a view of Pen-y-ghent and the fells just stunning. The everyday passings of nature – sunlight glinting on water, dappled light through the leaves of a tree, a new bud about to burst – slow down and enjoy the small things. Favourite place to just sit and look? Malham based artist, Katharine Holmes – she captures the beauty of the landscape so beautifully, includes natural materials from where she’s working and shares it with the world in the most amazing way. With her work bedded in the her family connections she has been a great friend to PaD welcoming many refugee groups into her home over the years. I pass a baby triceratops on my drive into work!